The past two weeks has been filled with a lot of fun sewing. Bright, colorful fabrics and big blocks so my lack of precise measuring doesn’t really matter. This quilt is for my son’s best friend, Josh. They have been in class together since kindergarten (four years) and now Josh is moving away. So, we decided to make him a memory quilt. First I chose a pattern. 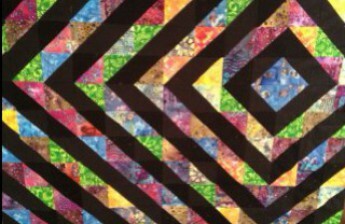 This was quite easy as I had seen Miss Print’s Euclid quilt a while ago and had decided it would be perfect for a memory quilt. Luckily, she had a tutorial to go with the beautiful quilt. Over the past month, I have handed out fabric (Kona silver) to all the kids in the grade as well as the teachers and some of the administration (it’s a small school!). There were lots of other sweet quotes and pictures. I loved the Kona silver as the base color. White was too stark and the silver still matched whatever I would choose for a background and/or sashing. Next I chose fabric to border the silver fabric. Four different color-ways of the same tie-dye-ish pattern. I wasn’t sure if it would be completely overwhelming, but though busy, it all blends together really nicely. Little by little the kids have been returning the fabric to me and this past week I sat down and started sewing it all up. Today the quilt top was finished. At about 60 x 65, it turned out larger than I expected (especially since I hadn’t tried to calculate)!